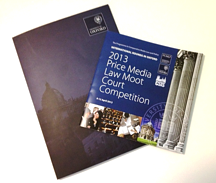 April 2013 – Held at the University of Oxford, UK, the sixth instalment of International Rounds for the Price Media Moot Competition saw almost 200 law students from around the world pit their skills across four days (9-12 April) of intense courtroom debates. George Hwang is honoured to have participated as a Senior Judge, judging the semi-finals. Our participation enhances the judging panel with an Asian perspective. Established in 2008, the programme fosters interest in international law governing freedom of expression issues. The Programme is named in honour of Professor Monroe E. Price, the founder of the Programme in Comparative Media Law and Policy (PCMLP) at the University of Oxford’s Centre for Socio-Legal Studies, in recognition of his lifelong devotion and outstanding contribution to the development of media freedom and the rule of law. More broadly, the Moot Court Programme is also a tool for raising the profile of freedom of expression by bringing informed and effective debate and discussion on significant issues of information flows and technology to many parts of the world. We are pleased to share that Singapore’s SMU team made it to the semi-finals.